JFK now stands in downtown Fort Worth. Or, at least, his statue does. Recently, I had the opportunity to learn more about the new JFK Tribute, an open air, permanent exhibit and website that pays tribute to President John F. Kennedy and the final two speeches he gave on the morning of November 22, 1963. My latest article on The Ultimate History Project talks about that day and the development of the project, done in part by Downtown Fort Worth, Inc. I was surprised to learn about all the North Texas connections to this national story. It’s a timely topic with the 50th anniversary of Kennedy’s assassination later this year. One of the upcoming events will be the bringing back together of a special art collection, Hotel Texas: An Art Exhibition for the President and Mrs. John F. Kennedy, to be shown at the Dallas Museum of Art and the Amon Carter Museum in Fort Worth. Want to find more of Kennedy’s or other presidential speeches and public statements? Check out the JFK Presidential Library and Museum and The American Presidency Project. Will Rogers Memorial Center is located in Fort Worth’s Cultural District. 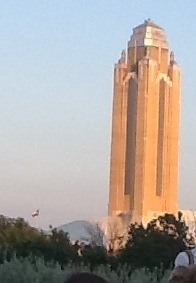 The Art Deco building is home of the Southwestern Exposition and Livestock Show. As the Fort Worth Stock Show and Rodeo winds down at the end of this week, the Texas State Historical Association’s 2013 Annual Meeting will be here before we know it. The meeting is always held the week of the anniversary of Texas’ independence from Mexico — March 2, 1836. And this year, it will be here in Fort Worth! Known as “Where the West Begins,” Fort Worth is home to great art and its share of history, including the Historic Stockyards. Whether in town or not, check out Fort Worth’s new JFK Tribute to President Kennedy and the final speeches that he gave the morning of Nov. 22, 1963. Early registration for the 2013 TSHA meeting ends February 8th. The full program (with some great images from the Tarrant County Archives) is available on the TSHA website. Where is the history of medicine in Texas? Texas has a rich history of medical education, research, and innovation. Yet, much like the candy-cane, striped shirt-wearing Waldo, the history of medicine, public health, and its allied sciences is often hidden in plain sight. This history can be found in the architecture of hospitals and medical schools like Cooks Children’s iconic blue roof in Fort Worth and Old Red at the University of Texas Medical Branch in Galveston. Or the minor procedures and major surgeries that comprise Western medicine today like the heart transplant pioneered by Houston surgeons Denton Cooley and Michael E. DeBakey. It can also be found in the programs and educational resources available to Texans, like those for diabetics and their families, coordinated by the Texas Diabetes Council. When I was doing graduate research into the history of medicine and public health in Texas, I discovered a number of important local resources. However, a lack of transparency made it difficult to identify and access these resources. This frustration made me curious to learn more. Several medical librarians were kind enough to reply to my informal query about the types of resources they have and the most common reference questions they receive. A good rule of thumb for the history of medicine is: it’s kept where it was created. Whether you are looking for old medical journals, biographies of physicians, or historical information on hospitals and medical associations, your best bet is to look for the nearest medical school or public health library. Major medical centers and universities located in cities like Dallas, San Antonio, Houston, and Galveston are where the majority of historical resources can be found. Extensive collections exist throughout the state in places like the John P. McGovern Historical Collection and Research Center in Houston and the Special Collections at UT Southwestern Medical Center Library in Dallas. For example, biographical information on physicians is a popular research request. Medical school yearbooks and directories, like Polk’s Medical and Surgical Register of the United States, are important genealogical resources. Biographers and family historians can take advantage of the Texas Physicians Historical Biographical Database online thanks to the library at UT Southwestern. The McGovern Library also has Polk’s Medical Register and Directory digitized and available online. Archives of past medical journals sit on the shelf at many medical libraries, but assorted issues are online through digital portals like The Medical Heritage Library, Texas Heritage Online, and The Portal to Texas History. A quick PubMed search can help you identify specific articles and dates to help you in your quest for older journal articles on health and medicine in Texas. the public university library system — Published conference proceedings, reports, and education pamphlets get circulated throughout the library system as well as in state and local archives. the creating agency, governing body or professional association — Many, like the Texas Diabetes Council and the Texas Medical Association, include publication archives on their websites. retracing the bureaucratic maze to locate records within the state, county, or city archives — I recommend the TARO database for a search of Texas collections. For more resources, check out these digital catalogs and online exhibits dedicated to the history of medicine in Texas. UT Southwestern Library’s online exhibit using Omeka, “Medical Milestones in Dallas, 1890-1975,” includes great examples of the history of medical care and education in Dallas, plus an image repository. The Blocker History of Medicine Collections at the UTMB in Galveston’s Moody Medical Library includes The Centennial Oral History Collection, celebrating Texas’ first university medical school. The P.I. Nixon Medical Historical Library at UT Health Science Center in San Antonio has special collections for the history of medicine and university archives, including a Digital Archive. Texas Woman’s University’s Woman’s Digital Collection includes photos and oral histories on nursing and TWU’s health science program. Want to find the history of medicine in another state? The U.S. National Library of Medicine maintains a Directory of History of Medicine Collections by state within the United States and other countries. Also, for another state perspective, check out the newly launched History of Medicine in Oregon website. October is Archives Month! In celebration of American Archives Month 2012, the Council of State Archivists has compiled a list of special events and activities by state on their website. Texans will want to check out the PDF of the 2012 Texas Archives Month poster on the Texas State Library and Archives Commission website. This year’s theme is “Preserving Texas’ Civil War Records” to commemorate the sesquicentennial of the Civil War — that’s 150 years since the start of the war in 1861. For Civil War and other Texas state records explore their online collections. Take a look at the Civilian Conservation Corps plans and drawings from the Texas Parks and Wildlife Department to learn about public works projects in Texas during the Great Depression. Many are on Flickr Commons. A while back, I discovered a stack of old family photos and documents, including my relative’s Certificate of Discharge from the CCC. Part of Company 889, he helped build roads at Caddo Lake State Park. The CCC drawings were a great find that made my relative’s service record come alive (in color, no less). It was no longer just a camp number (Camp SP-1-T), but an actual place that people still enjoy today. For those who don’t happen to have CCC service files hanging around their closet, CCC Enrollee Records can be found at the National Archives at St. Louis. For a list of CCC Camps by state, the Civilian Conservation Corps Legacy organization has a helpful index. In the midst of pumpkin spice lattes and flu shots, American Archives Month is great way to recognize and celebrate those who preserve the documentary heritage of our communities. The threat of closure for the Georgia State Archives reminds us of the importance of making records available, an essential service to students and teachers, scholars and genealogists, and the public at large. Check out what your local archives has to offer. Enter your email address to follow Finding Aids & Beyond. You will receive notifications of new posts by email.